Synopsis of the GSOC Friday night lecture given on April 14, 2017, with speaker Dr. Anita Grunder, Professor and Associate Dean for Academic Programs in the College of Earth, Ocean and Atmospheric Sciences, Oregon State University. 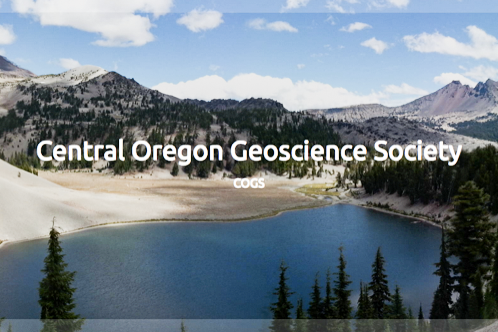 April’s Friday night lecture was given by a truly distinguished Oregon geologist and highlighted recent research into an area that has long intrigued geoscientists about Oregon. Dr. Grunder has led a team of researchers, including PSU’s Martin Streck, exploring the possible origin of the magma that has peppered Oregon’s High Lava Plains geologic province in the last 12 million years. This magma includes both rhyolite and basalt eruptions in a swath of territory between Steen’s Mountain region to the southeast and Newberry Volcano to the northwest. Volcanism illustration used in the lecture. Recent basalts are shown in a darker blue, and recent rhyolites in red. Older outcrops are faded in color. Miocene flood basalts are light blue. The browns are the andesite lavas mostly found in the Cascade Range. The High Lava Plains (HLP) is a geographic area of low relief that is paved by basalt. It is separated from the Snake River Plain that extends into Idaho by the Steens escarpment. To the south of the HLP lies the northwestern region of the Basin and Range Province. The HLP contains episodic eruptions of silicic rhyolite magma that get progressively younger to the west. Some of the more well known of these eruptions include the Devine Canyon Tuff (9.63 ma), the Rattlesnake Tuff (7.09 ma), the Hampton Tuff (3.80 ma), and the eruptions from Newberry Volcano (fairly recent). Also peppered along this track of rhyolite is a track of basalt eruptions that are not time-trending but occur in pulses across the province. Further muddying the waters is a track of basalt and rhyolite that is time-trending in the opposite direction from the Steens region east across Idaho and culminating today in the Yellowstone Volcano. It is believed by many geoscientists that this track, originating with the Steens and Columbia flood basalts in the Miocene, is the result of a magma plume over which the North American tectonic plate is travelling. This volcanic system is known as the Yellowstone-Snake River Plain volcanic system (YSRP). And yet a further complication is the Cascadia Subduction Zone to the west, creating the Cascade Mountains, and the oceanic plate subducting below the Cascade Range and points east. So the picture of volcanic trends originating at Steens Mountain is a bit confusing, and geoscientists have long grappled with an explanation for the HLP track of volcanism trending in nearly the opposite direction from the main track of YSRP volcanism. In steps Grunder’s group to the fray. A big help in resolving some questions about the makup of the crust was a very dense array of seismometers emplaced by the many students employed in the HLP project. In addition to the crustal imaging made available by the array, the group took many samples of the basalt and rhyolite with which to analyze and compare with samples taken from other volcanic systems, including the YSRP, the Columbia River Basalt Group, the Cascades (North, Central, and South), and mid oceanic ridge basalt. The chemical analysis of the HLP basalts were particularly insightful. They were slightly enriched mid ocean ridge basalts in composition, typical of basalt originating from deep inside the mantle. They did not resemble either the Columbia River Basalt, Cascade Range or YSRP basalts. Accordingly Grunder’s group surmised that there is an upwelling of asthenosphere right under the continental crust in this region. The team still needed an explanation of the progression of the rhyolite magmas westward. 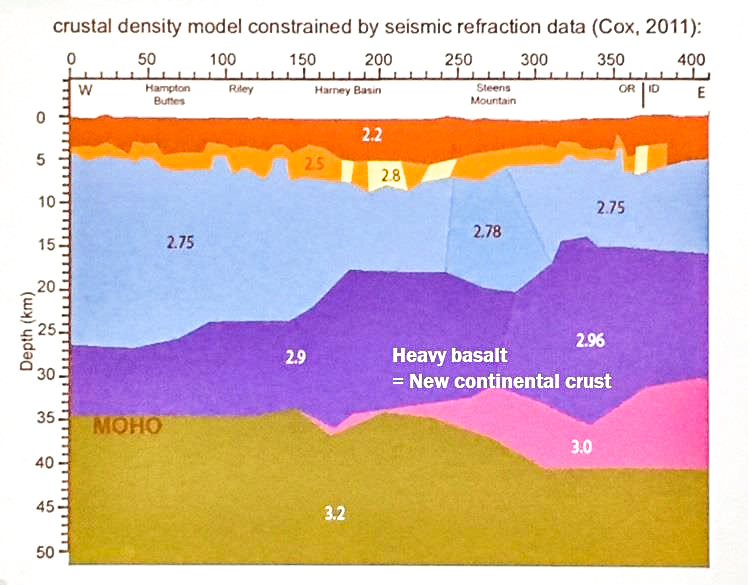 This geoplacement of the eruptions plus the construction and analysis of various models of upwelling produced by various configurations of the subducting plate led the group to conclude that the oceanic crust subducting under the HLP is progressively steepening and the southeastern corner is tipping downward, allowing deep mantle magma to flow around it and up under the North American continent, where it erupts onto the surface in the HLP. Schematic models (nearly to scale and with approximately no vertical exaggeration) of the processes that drive mantle upwelling and counterflow as a result of the subducting Cascadia slab. Plate motions are shown with black arrows and mantle flow with red arrows. Red triangles are the current day locations of Cascade volcanoes and the Cascades, HLP, and NWBR physiographic provinces are outlined (Figure 1). The position of the trench and transform faults (red dotted line) are also shown. (a) Limited corner flow associated with downdip motion only, before trench rollback commenced. (b) Slab rollback initiates a much stronger mantle flow as North America continues to advance on the trench. (c) The addition of slab steepening due to the southern edge of the slab being unsupported can further enhances this flow, which is concentrated under the HLP. Differing extensional rates in the continental slab (crustal factors) may also play a role in the volcanic expression. The current geometry of the Cascadia slab is shown in orange. (d) Simplified version of Figure 7c showing the current Cascadia slab only. Angles given are approximate and taken from McCrory et al. and Roth et al. and the slab steepens markedly at the volcanic front (∼100 km depth) [Pavlis et al. 2012]. 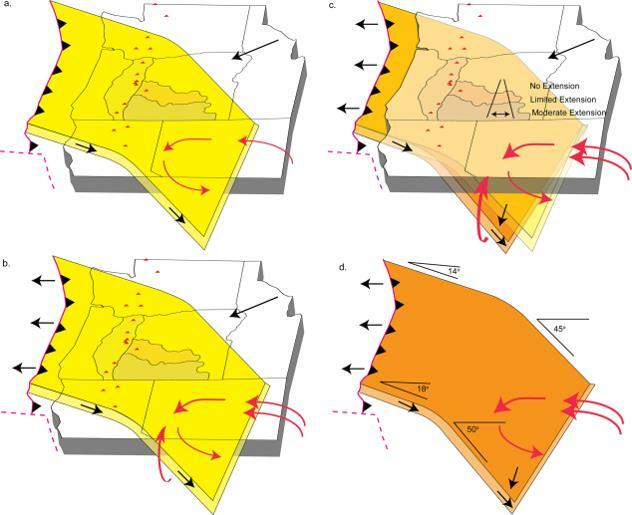 From: Bimodal volcanism of the High Lava Plains and Northwestern Basin and Range of Oregon: Distribution and tectonic implications of age‐progressive rhyolites from Geochemistry, Geophysics, Geosystems Volume 14, Issue 8, pages 2836-2857, 8 AUG 2013. The HLP basalts tested from various times have characteristic compositional groups, but all can be created from same source, i.e., the upwelling mantle magma. The basalt mixes with crust, and sits and gets loaded with more basalt below. Crystal fractionization occurs in the magma chambers, dividing the magma types further. Rhyolites going west towards Newberry get more basaltic over time, and crust is being added to the basaltic magma over time. Grunder believes that this may be a similar mechanism to that of early continental growth. But wait, they're not done yet! What should happen to the crust when you add all this basalt below? It sinks! The HLP group checked out the density using seismic wave analysis, and it does indeed. Using the imaging from the seismometer array, the group produced a crustal density model which includes a huge amount of material with basalt density at the base of the continent, showing all the basalt magma which is being added to the continent; a mechanism of continental growth. So in addition to explaining the origin of the magma, the group has weighed in on the question of whether the continents can grow or the amount of continental crust is constant over time. Illustration of crust model used in the lecture. Numbers shown in the crustal layers are the specific gravity found therein. “Bimodal volcanism of the High Lava Plains and Northwestern Basin and Range of Oregon: Distribution and tectonic implications of age-progressive rhyolites,” by Mark T. Ford, Anita L. Grunder, Robert A. Duncan, First published August 8, 2013, Available online at AGU Publications website. “The Oregon High Lava Plains: Proof against a plume origin for Yellowstone?,” by Brennan T. Jordan, Earth Sciences Program, University of South Dakota, and published on website MantlePlumes.org. Oregon Geology (2012 edition) by William and Elizabeth Orr is a great introduction to the geophysical provinces of Oregon. Also, the introductory chapter of Roadside Geology of Oregon, second edition, by Marli Miller has a good, brief introduction to Oregon geology and the rest of its contents may spur you to do some exploring of our great state on your own.